They rode to Quantez town…half-way to freedom but all the way to Hell! This week I want to highlight a movie that you’ve probably never heard of. 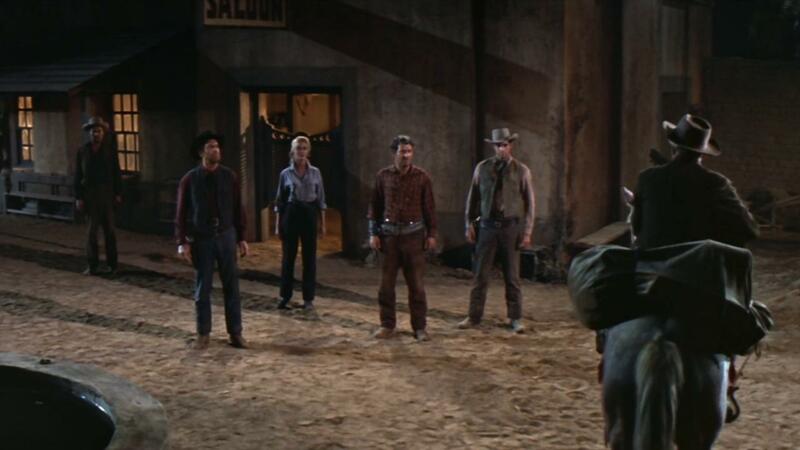 As you may already be aware, I’ve become quite a fan of movies from the 1950s, especially westerns. The societal progression of the era (ERA) allowed filmmakers to delve deeper into certain themes than had previously been acceptable, and advances in technology meant that the movies themselves were looking better than ever. Quantez is an obscure movie, but respected by many fans of the western genre, even if it wasn’t by the critics of its time. 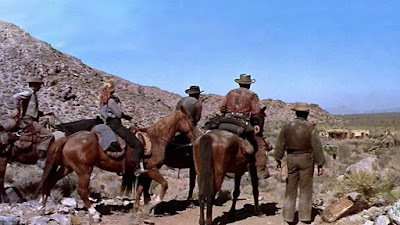 This 1957 (such a great year for westerns!) film from Universal International (UI) stars the outstanding Fred MacMurray as a gang member named Gentry. 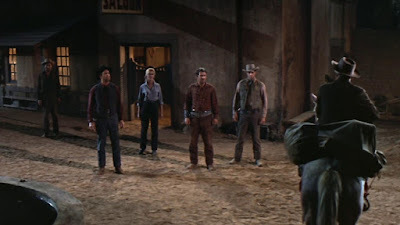 The gang, led by an outlaw named Heller (John Larch of Dirty Harry), has robbed a bank and is being pursued by a posse that wants to bring them to justice for their crime, so they head for the border town of Quantez where they can lay low and decide what their next step should be. Things don’t quite go according to plan, and they arrive to find that Quantez has inexplicably become a ghost town. To make matters even worse, there is an Apache attack party watching them from the outskirts, planning what their next step should be. The middle of the movie is a tense chamber drama in which the gang starts to corrode from within, but Fred MacMurray’s Gentry has a secret. I won’t spoil it for you. The big strength of Quantez is MacMurray’s performance. These days people probably know the actor from The Absent Minded Professor and My Three Sons or they don’t know his work at all. I genuinely feel like Fred MacMurray doesn’t get nearly as much respect as he deserves as one of Hollywood’s greats because he was an awesome actor who was capable of playing just about anything. It’s true that he spent his later years playing affable dad-type roles, but an exploration of his resume reveals a wide range, including plenty of gritty tough guys and more than a few broken heroes. He could play noble in movies like The Texas Rangers or be a noir star in Double Indemnity. Here he gets to be nuanced as a bad guy who is tired of being a bad guy. MacMurray does a great job at conveying his fatigue with this whole outlaw thing and showing the weight of it all. He’s also smarter and tougher than his gang leader, but plays it close to the vest. John Larch turns in kind of a big performance as the insane gang leader Heller, and I don’t mean that in a good way. It’s a little too over the top for my tastes, but it’s also good to see Larch, who you might also recognize from The Amityville Horror, in a very early role. I’m more interested in Dorothy Malone (The Big Sleep) as Chaney, the gang leader’s mistress. Heller doesn’t treat her very well, and Malone gets to sink her teeth into her role as a woman who wants things to be better, but also understands that she’s made poor choices and that it’s most likely too late to turn things around. We’re still miles away from anything resembling a truly feminist perspective, but the movie does a good job of letting Chaney be an actual character instead of just window dressing. Quantez was directed by Harry Keller. Keller made a bunch of Republic westerns in the black and white days, but his biggest claim to fame was being one of the directors that was hired to “save” Orson Welles’ Touch of Evil with reshoots and edits. This film was written by R. Wright Campbell, who was one of Roger Corman’s screenplay mainstays and penned Five Guns West, Machine Gun Kelly, and The Masque of the Red Death for the low-budget icon. 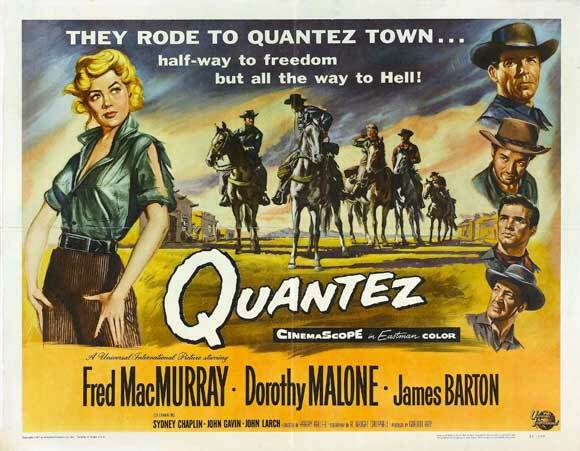 As you can probably tell from this review, Quantez doesn’t necessarily do anything revolutionary and isn’t in the same league as some of the great westerns that came out of the 1950s. 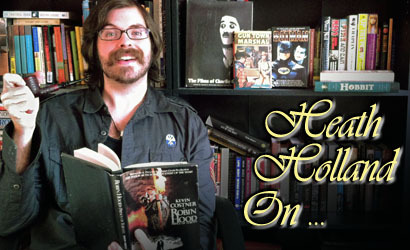 It’s short, cheap, and was made to serve as half of a double bill. But if you’ve been reading my stuff for very long, you know that I LOVE the low-budget movies of this era because they compensate for their lack of budget and spectacle with taut psychological drama and outstanding characterization. These B-movies frequently showcase many actors giving the best performances of their entire careers. More often than not, these films are populated by actors who spent years in the studio system but had become fading stars. It’s ironic that all their years of experience usually landed them in cheap B-films and television. Luckily, we get to examine these movies and appreciate their fine performances. Unfortunately, Universal has not made it easy for movie fans to see Quantez. There is a DVD, but it’s from Universal’s “Vault” series of DVD-R titles. Last year the film miraculously turned up as part of a Walmart-exclusive package of UI westerns (all from the 1950s) that literally has three different titles, depending on where you look. The front of the box reads “8-Movies: Westerns” while the spine reads “Westerns: 8-Movie Collection.” If those aren’t descriptive enough for you, the back of the box calls it “8 Action Packed Westerns.” This is an actual Universal release! Way to go, guys. The box set was questionable in quality (the eight movies are on two single-sided dual layer discs, but somehow still look okay because the movies are so short) but was also dirt cheap (I picked it up for 5 bucks). Unfortunately, it seems to have already gone out of print. There’s also a region free Blu-ray being sold in Spain from a company called Feel Films (I like to feel films), but even this is burned onto a BD-R and is reportedly just a 1080p upconversion from the existing Universal DVD master. This movie deserves so much better. If you are able to get your hands or eyeballs on it, though, I think Quantez is worth your time. There’s just something about it that sets it apart from other films of its ilk, and I instantly connected with it when I saw it. Watching it now requires a little work to track it down, but I think it’s worth it. This movie deserves better than total obscurity. This one’s for all the genre nerds like me who love hanging out on a Sunday afternoon and disappearing into the wonderful world of the 1950s. There are lots of people and boutique labels championing old noir and horror films, but sometimes I worry that some of the movies from the greatest decade for the western genre are being lost. So if you’re ever flipping through the channels or digging through some bin of cheap DVDs at Walmart and see the title Quantez, maybe the title will ring a bell and you’ll remember that Heath Holland thinks this one is pretty awesome. Well, you convinced me to buy 7 Men From Now, and I enjoyed it, so maybe I should opt for Quantez too. I wonder if the DVD-R is good enough quality to justify 20 bucks? Next time I get paid I may have to find out. That 8-pack of westerns was a great buy. I got mine for $3.00, which is $0.37 per movie! And they were each in color, had great stars in them and were at or under an hour and a half apiece, which helped them go down easily. "Quantez" was the last one of the eight and a nice way to end. Malone was searingly beautiful, even in her jeans and old shirt, and the rest of the cast was interesting, too. She and MacMurray did make note to one another that they were only in it so that they could work with each other again and that each of them signed on because they thought the other already had done so! They didn't have much fun making it apparently, though still photos from behind the scenes seem pleasant enough.